Once upon a time, there was a girl who decided to teach her dog some tricks. She figured out that if she gave her dog something he liked after he did something she liked, he was liable to do the thing again. So she taught him some simple tricks using food and play as reinforcement. As she went along, her dog started finding playing training games lots of fun in and of themselves. But she still used food and play. He liked earning his “pay” and she liked giving it to him. She didn’t see any reason to stop. This girl was unusual in that she didn’t try to tell her dog what to do in words. She realized what is not obvious to so many of us: he didn’t speak English. Things worked out just fine because he could generally discern from context and her gestures what she wanted to work on. She used a little platform to teach him to pivot in a circle. He would put his front feet on the platform and walk around with his back feet and rotate. He got good at this and soon could spin in both directions. As soon as he saw the platform he would run over to it and start to pivot, although she could ask him to stop with a hand signal. One day she decided she’d like to teach him a different trick using the little platform. She wanted him to sit on it. She got out the platform and he ran over and immediately started spinning. She smiled and signaled for him to stop and he did. Using hand targeting, she got him up on the platform with all four feet within a few minutes. 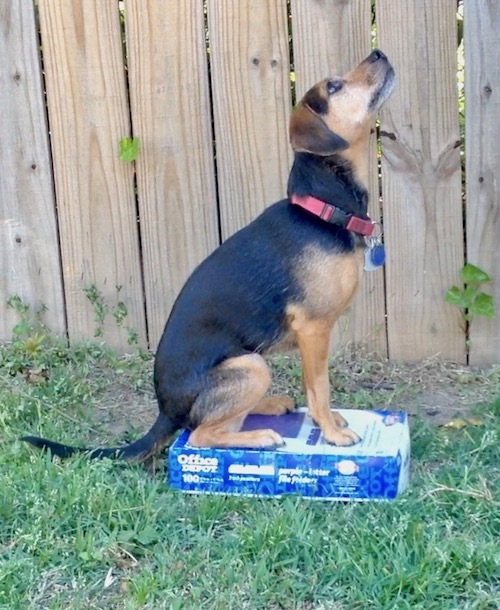 It was easy from there to get him to sit. He earned plenty of cookies during this learning process. The next time they played training games with the platform, he pivoted at first. But she gestured that she wanted him to get up on it and sit, and soon he did. Each time they trained, he spun less and sat sooner, until one day he ran in and sat on the platform. She told him how smart he was and gave him a cookie. Over the next couple of weeks, she had him do lots of things on top of the platform and didn’t ask him to spin. Now he would always run to the platform and sit on it to start. Then she asked him to start pivoting again. They worked on both things equally. After a little awkwardness at the beginning of the session, he would figure out what she wanted. One day she got ready to train and put the platform out. Her dog ran in and then stood stock still next to the platform and looked straight at her. He seemed to be asking, “What are we going to do today?” She realized it would be nice for him if he knew which thing she wanted him to do that day, rather than always having to figure it out by trial and error. She thought about it and realized she could create some way to let him know which set of tricks she wanted to work on. She made herself a big hat out of newspaper. From then on, every time she wanted him to get all the way on the platform, she wore the paper hat. When she wanted to work on spinning and pivots, she didn’t wear the hat. It took only a few sessions for him to catch on. Thereafter he would immediately offer the right starting behavior depending on whether she was wearing the hat or not. Question: What did the girl create with the hat? Question: Did she really “invent” cues? Answer: No. She discovered them on her own and put them to use. See below. Bonus question: Looking at the photos of Summer and Zani above, what might be a contextual cue that I want my dog to sit rather than pivot? OK, I’m a little obsessed with cues. But I would really like to share my (admittedly limited) understanding with those who are newer at this than I am. First, all sorts of things can be cues. If you don’t create a deliberate, explicit cue, dogs will usually figure out what you want from other indicators. These can come from the environment or your actions. And they usually figure that out early, so even before you think you have a cue—you have one. Before the girl started using the paper hat, there were still lots of cues for the dog. But they were fluid and not systematically organized. You might not even know what a dog’s cue actually is! Lots of times when we think the dog understands a verbal cue, they are heeding something else. Try this: put your dog in front of her crate (if you use one), point, and say, “Purple cow!” Some other time, get your dog in front of the crate, don’t point, but just look at it, and say, “Daddy long legs!” Dogs notice contextual cues brilliantly, and most will get into the crate in this situation. Everything else about you is saying: “Get in the crate” even if your words are different. 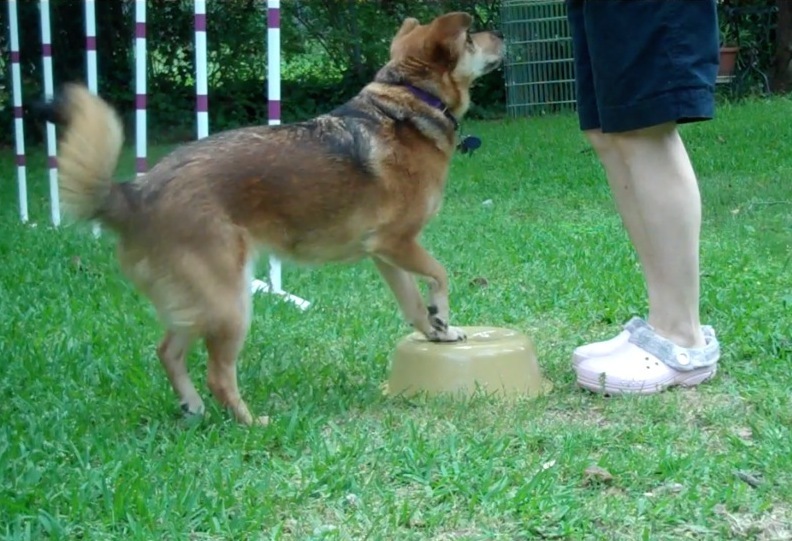 If you had taught your dog to heed the cue over your body language and had complete stimulus control over it, the “proper” response would be for the dog to stand and look at you. He should wait for further instructions if you give a verbal cue he doesn’t recognize. But many people don’t work that hard on verbals for crate or mat behaviors. So dogs who are conditioned to like their crates will leap in at the slightest hint that that might be reinforceable right now. Finally, cues in training or the real world don’t have to be words or gestures. The “Open” sign that stays lit up all day in a store window is a cue that says that going into the store will be reinforced by the ability to shop for a while. When you’re at a club, the music going on is a duration cue for people to dance. Most people stop when the music goes off. You don’t have to, but it’s more fun (reinforcing) to dance while the music is on. So a paper hat worn continuously can be a cue that a certain type of training is going to happen and a certain family of behaviors will likely be reinforced. Here is Summer in a situation where contextual cues and the matching law conspired to make her fail to respond correctly to a verbal cue. The contextual cue was the mat. All Summer had to do was feel a mat under her feet and she would lie down. It was that automatic. At my house, if a dog lies down on a mat, reinforcement is very likely to follow. And the matching law says that behaviors with big reinforcement histories are more likely to be performed than behaviors with scanty reinforcement histories. And Summer had hundreds, even thousands of past reinforcers for lying on the mat. Even after she learned to sit from a down on the mat, she still responded incorrectly part of the time. She had a long-standing habit to break. Having clear cues is a way to be fair to your dog. Remember, a cue is an indication that a certain behavior, set of behaviors, or behavior chain, is likely to be reinforced. Having unclear ones defeats the purpose. Help your dog by being clear about cues! « Does Your Animal Have Control?